Here’s how to make the most of just 24 hours in Tanah Rata, Cameron Highlands. 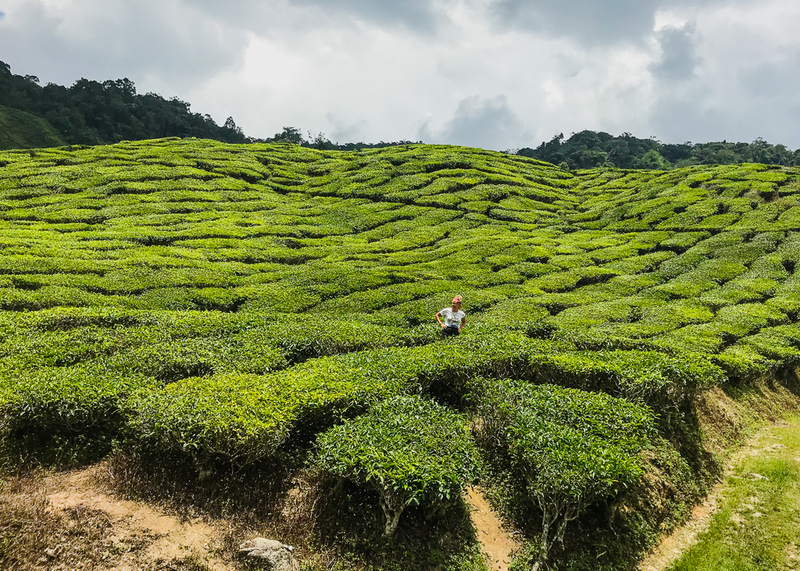 Originally founded in 1885 by William Cameron, it didn’t grow in popularity until the Brits started to realise the potential of growing tea in the mountain slopes. It is still Malaysia’s largest tea-producing region. During the colonial time, many Brits would head to the highlands for relief from the heat, and then loads of people decided to retire there too – how lovely. The area is also known as a major supplier of legumes and vegetables to both Malaysia and Singapore with its many farms, and is one of Malaysia prime tourist destinations. 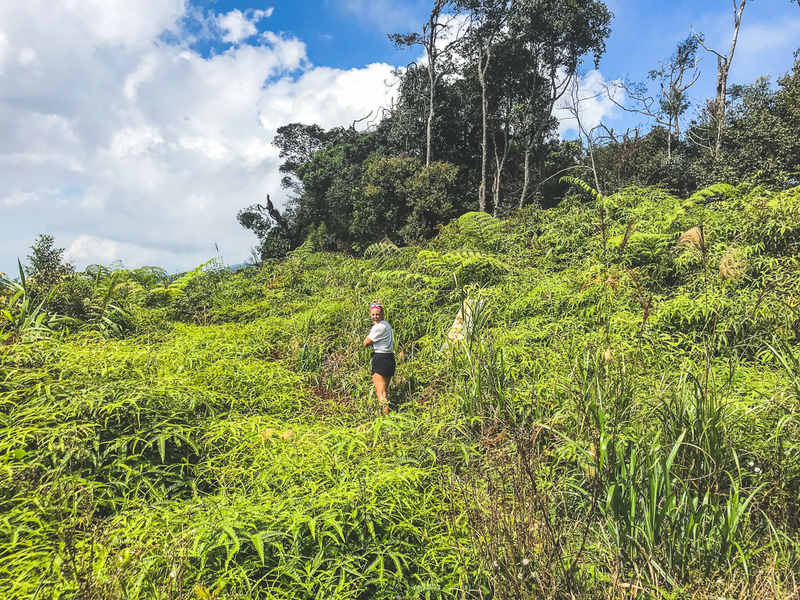 I have to admit, having not done too much research about the Cameron Highlands I hadn’t expected how built up the tourist scene there would be. It kind of looks like an Austrian Skiing destinations but in the summer haha! In one of the main towns Tanah Rata we’re talking a few cute cafes, local food stalls, local restaurants and sadly a Starbucks (I’ve been avoiding Starbucks where necessary this past few years – choosing to support independent coffee chains in the UK instead, shout out to my babes at Green Monkey). Saying all that, there’s of course plenty of beautiful hiking options, cheap places to eat and great places to stay. Due to the popularity of the hostels we split into two twos for accommodation. Thijs and I headed to SleepBox following a recommendation from a Koh Tao friend, and the girls stayed at Travellers Bunker. SleepBox, a modern hostel/hotel which provided “pods” for sleeping with charging points, a light, a teeny fan and a small table and mirror. Cosy and comfortable, and importantly a big secure locker for your bags. Breakfast was included, coffee/tea, toast and some random cakes haha. Not ideal for those GF pals I have but there were shops nearby and plenty of food stalls. We arrived with no idea of which trail to take. Some hostels offer full and half day tours to certain areas including the mossy forest, but in the spirit of saving money we opted to find our own way. 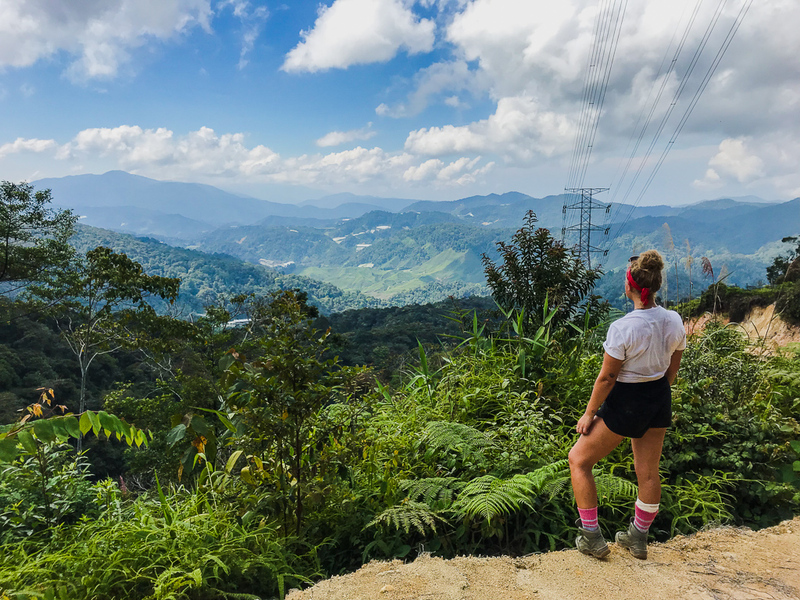 SleepBox recommended we take trail 10 and 6 which was about a 4 hour hike, up and down hill with awesome views of the tea plantations. Top Tip: Download Maps.Me for offline map guidance, plus all the trails are marked on there too. Happy hiking. Trail 10 took us up hill to the summit of Gunung Jasar, through the shaded jungle with plenty of tree root stairways within a bushy corridor. At the top, with views over the highlands we descended down a red limestone path towards another great view point as trail 10 ended. Next we fought our way onto trail 6 downhill and through the overgrowth, pretty fun but I do recommend grippy trainers or hiking boots as Emma’s Nike AirMax were providing no sliding supporting down the sandy path haha! A bit of downhill road walking (particularly hard on the knees, we took our time to stretch and go slow), took us to the final section of trail 6, all the way through the tea plantations. A spatter of rain here and there kept us cool in the middle of the day and the sunshine shining through the clouds really made the green of the tea plantations pop. The beautiful shape of the bushes, the texture of their planting design was spread out right in front of us – a spectacular scene to be wandering right through. We ended the hike at the Cameron Valley Tea House and started to head back down the main road. 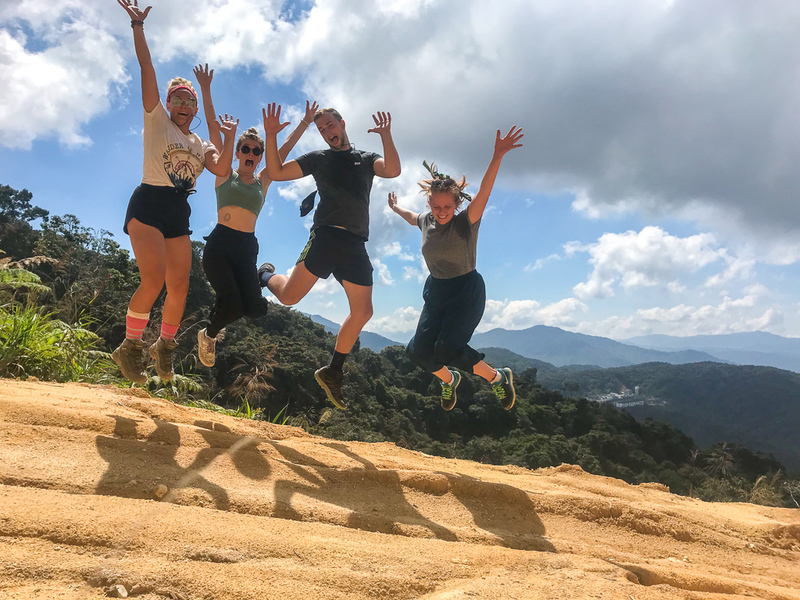 We’d been advised to hitch hike the hour walk / 10 min drive and given we were all pretty hungry and tired, I found a truck on the side of the road who then took us down the road to Tanah Rata – wiiiinnner!! We met for dinner at Restaurant Kumar – a South Indian spot (it’s not in the same place as google maps says but just near to HSBC on the Main Street). I had a delicious veggie murtabak (a DELICIOUS stuffed pancake or pan-fried bread which is commonly found in Malaysia), Laura a veggie curry, Emma tandoori chicken and Thijs a realllllyy nice butter chicken dish. Full, happy smiles all round. There’s a few other cheap places down the road too, you can get a Nasi Goreng (literally meaning “fried rice” in Indonesian) for about RM 7 and other fried noodle / rice options. Well worth a visit, even just for one hike. Our next stop was the Perhentian Islands off the east coast of West Malaysia. Only a 9 hour + journey via two buses and a boat. More on that trip to come soon 👀! Check out this blog for info about all the different trails. Find SleepBox on Agoda, Booking and HostelWorld. Where next? We took a bus to the Perhentian Islands, but you can get to Penang, KL and many more spots in Malaysia from the Cameron Highlands via bus. Just check out the local tour operates in the Tanah Rata.